There are many ways to play the CPU in NBA2K as well as play other human opponents you don't know. However, there are times when you want to play people that you know - not strangers. 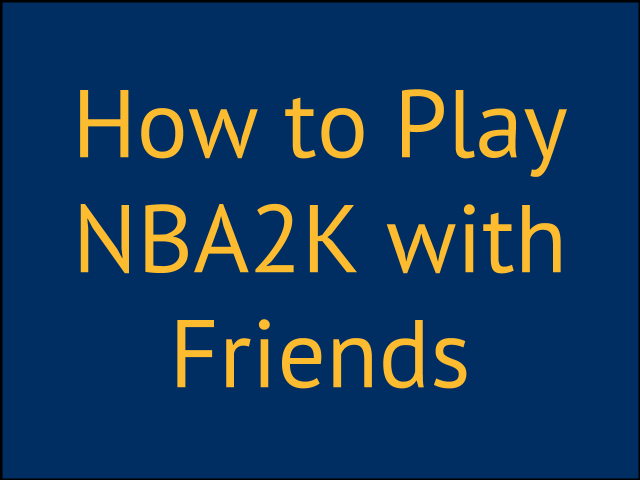 For those occasions, I'm going to show you how to play NBA2K with friends. Learning how to match up with your friends is something you'll want to do more and more after you get sick and tired of playing all the cheesers you'll find online. You'll find more games if you yourself are more fun to play. Here are some tips to be a more enjoyable opponent. Let's go over how you can match up with friends both online and offline. While I'm at it, I'll also throw in several tidbits that I've learned over the years. Head-to-head offline This is the old school method of playing against your friends. You have a friend come over to your house and you fire up your console. You each grab a controller and choose a squad in play now. The downside to playing in the same room is that your opponent can see what adjustments you make since you are watching the same screen. Cooperative play offline This is the same as head to head offline. The only difference is instead of playing against each other, you each choose the same team. Once on the court, you can alternate the players you choose unless you choose player lock in your controller settings. And you aren't limited to two people, you can have more than two. Me, my son and my best friend once played on the same squad against the hall of fame cpu with some 99 rated players. We had a blast all playing on the same team in the same room yelling and shouting and directing each other on the court. Head-to-head online This is the most common way to play your friends these days. You meet people online and then match up in play with friends. Invite your friend to your locker room, set the settings (private match, difficulty and minutes per quarter) and then you choose your teams. A twist you can do is to choose the team up option and choose opposite teams and play on player lock. Cooperative play online In addition to playing head to head, two friends can also play on the same team essentially on player lock. Instead of doing a private match, you'll choose team up and then you'll pick players on the same team instead of opposing teams. Team up If you have several friends you want to play with at the same time, you can also play in team up mode. There is either regular team up or all star team up. Team up is a blast with the right players. I've actually played team up with ten guys I knew on the court at the same time which is really cool. One league I played in, we did an allstar game this way as well. But probably the coolest thing I've done in this option is to have five of my friends all of the same team and we played the hall of fame cpu on 12 minute quarters. It was really challenging but it was a blast. I actually think that my group of guys were the only team in the world playing the hall of fame cpu on 12 minute quarters (and beating the HOF CPU!) One of my teammates was PSN RedStickGamer who recently got drafted to the NBA2K eLeague Bucks. Head-to-head online MyLeague option You can also play your friend in an online myleague setup. Most people use online MyLeagues solely for league purposes. I use the online MyLeague to setup tons of matchups each year just for head to head matchups. The benefit of doing this is that you get total control of your team setup that you don't get in the Play Now arena. Not only can you control the rosters, you can also control rotations, playbooks and defensive settings. In addition to playing head to head in the file, you can also do what a friend and I use to do. We'd each choose a team but in opposite conferences. Then we'd play out the season and matchup when we played with the goal to play in the finals. However, my favorite way to play in an online MyLeague is to skip the regular season and matchup in the playoffs in seven game series. I probably use this feature more than any other in NBA2K. It's my favorite thing to do and I set up several of these files throughout the year. MyTeam matchups In addition to matching up against your friends in the above ways, you can also play your friends in MyTeam using your team of chosen superstars. I like this option but the only downside is that you can't play 12 minute quarters. That's my preferred way to play. Here are 9 reasons why I love playing on 12 minute quarters. It's a shame to or I'd use MyTeam more. What's even more cool, at least I think it is, is that you can play on your own courts with your own uniforms. Technically, you can do that too in MyLeague but I don't typically do that. Park and ProAm If you have a MyPlayer, you can also play in the ProAm with your own five guys against other teams of friends. I don't play ProAm or in the Park so I can't share any tips with you about those modes specifically, but instead of using individual NBA players, you are all your own MyPlayer. A lot of thought goes into the MyPlayers use choose if you want to be a ProAm player. I can say that I'm big on being the power forward slot in these modes because I want to be a role player. I remember 25 plus years ago that my friend and I envisioned this concept and it's crazy that now it's a reality. Alright, those are some ways you can play your friends in NBA2K. Did I miss any? Let me know in the comments how you like to play your friends or if you use any of my ideas to play your friends.